Chicken cutlets are boneless, skinless chicken breast pieces with even thickness throughout, making them well-suited for grilling. Grill them with only light salt and pepper to add protein for a salad, or make a marinade with Asian or Latin American ingredients to make an international main dish. The even thickness of cutlets requires very little cooking time, so you can get dinner cooked and on the table in less than half an hour. Place a boneless, skinless chicken breast between two pieces of plastic cling wrap. Pound it to an even thickness with a meat mallet. If you prefer smaller portion sizes, slice the breast in half by placing the chicken breast on a cutting board and hold it with your non-dominant hand. Hold a boning knife parallel to the cutting board and slice through the breast horizontally to make even-sized pieces. Place the chicken cutlets in a bag with your choice of marinade and refrigerate it for at least one hour or overnight. Use a bottled marinade for fast preparation, or mix your own with a customized blend of ingredients. 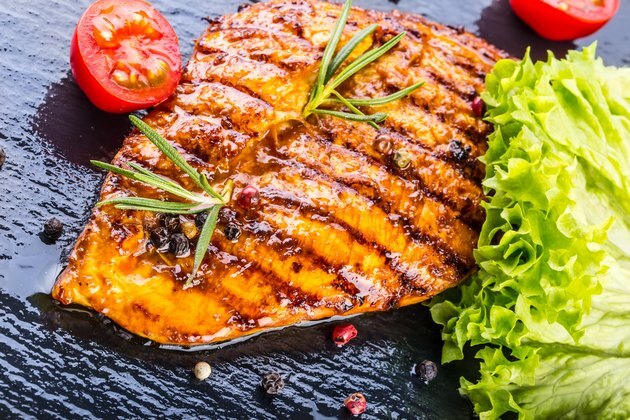 To make a marinade, include a fat, such as olive oil or coconut oil; an acidic component, such as vinegar or citrus juice; an assortment of dry spices; and other wet ingredients, such as chili sauce or Worcestershire sauce. Preheat the grill at medium-high heat, using either a charcoal or gas grill. If using charcoal, arrange about 25 charcoal briquettes in a pyramid, light the charcoal. Spread them out evenly when the fire dies down and the coals turn bright red on the inside and gray with ash on the outside. Rub the grill grates with cooking oil to prevent sticking. Do not spray non-stick cooking spray or you'll have a huge flame flare-up. Place the chicken cutlets on the grill and sprinkle spices over the top side, if you like. Close the lid and cook them for about four minutes on the first side, or until golden brown. Flip the cutlets over with a pair of tongs and replace the lid. Grill the second side for another three to four minutes to a golden brown color, or until they reach an internal temperature of 165 degrees Fahrenheit. Insert a meat thermometer in the center of each cutlet to check the temperature. Remove the chicken cutlets from the grill and serve immediately. Unlike meat such as steaks and pork chops, chicken does not require a resting period between removing it from the grill and serving. Serve the pieces whole, or cut them into strips or chunks for dishes such as fajitas and chicken salads.